When we place a gas cylinder on a van and the van moves, does the kinetic energy of the molecules increase? Does the temperature increase? No, kinetic energy of the molecules does not increase. This is because velocity of the molecules does not increase with respect to the walls of the gas cylinder, when the cylinder is kept in a vehicle moving with a uniform motion. However, if the vehicle is accelerated or decelerated, then there will be a change in the gas’s kinetic energy and there will be a rise in the temperature. While gas from a cooking gas cylinder is used, the pressure does not fall appreciably till the last few minutes. Why? Inside a cooking gas cylinder, the gas is kept in the liquid state using high pressure. Boiling point of a liquid depends on the pressure above its surface. Higher the pressure above the liquid, higher will be its boiling point. When the gas oven is switched on, the vapour pressure inside the cylinder decreases. To compensate this fall in pressure, more liquid undergoes phase transition (vapourisation) to build up the earlier pressure. In this way, more and more gas evaporates from the liquified state at constant pressure. Do you expect the gas in a cooking gas cylinder to obey the ideal gas equation? 1. In a cooking gas cylinder, the gas is kept at high pressure and at room temperature. Real gases behave ideally only at low pressure and high temperature. 2. Cooking gas is kept in liquid state inside the cylinder becaue liquid state does not obey the ideal gas equation. Can we define the temperature of (a) vacuum, (b) a single molecule? (a) Temperature is defined as the average kinetic energy of he partciles. In a vacuum, devoid of any electromagnetic fields and molecules or entities, the temperature cannot be defined as there are no molecules or atoms or entities. (b) No, we cannot define temperature of a single molecule. Since temperature is defined as the average kinetic energy of the particles, it is defined only statistically for a large collection of molecules. Comment on the following statement: the temperature of all the molecules in a sample of a gas is the same. Yes, at equilibrium all the molecules in a sample of gas have the same temperature. This is because temperature is defined as the average kinetic energy for all the molecules in a system. Since all the molecules have the same average, temperature will be the same for all the molecules. Consider a gas of neutrons. Do you expect it to behave much better as an ideal gas as compared to hydrogen gas at the same pressure and temperature? 1. As per the Kinetic theory, neutrons do not interact with each othe. Molecules of an ideal gas should also not interact with each other. On the other hand, hydrogen molecules interact with each other owing to the presence of charges in them. 2. Neutrons are smaller than hydrogen. This fulfils another kinetic theory postulate that gas molecules should be points and should have negligible size. A gas is kept in a rigid cubical container. If a load of 10 kg is put on the top of the container, does the pressure increase? No, the pressure on gas won’t increase because of this. The pressure will not be transferred to the gas, but to the container and to the ground. If it were possible for a gas in a container to reach the temperature 0 K, its pressure would be zero. Would the molecules not collide with the walls? Would they not transfer momentum to the walls? Since the pressure would be zero, the molecules would not collide with the walls and would not transfer momentum to the walls. This is because pressure of a gas is formed due to the molecule’s collision with the walls of the container. It is said that the assumptions of kinetic theory are good for gases having low densities. Suppose a container is so evacuated that only one molecule is left in it. Which of the assumptions of kinetic theory will not be valid for such a situation? Can we assign a temperature to this gas? 2. When a gas is left for a sufficient time, it comes to a steady state. The density and the distribution of molecules with different velocities are independent of position, direction and time. A gas is kept in an enclosure. The pressure of the gas is reduced by pumping out some gas. Will the temperature of the gas decrease by Charles’s low? If the gas is ideal, there will be no temperature change. Moreover, Charles’s law relates volume with temperature not pressure with temperature, so the cause behind the phenomena cannot be explained by Charles’s law. Explain why cooking is faster in a pressure cooker. In a pressure cooker, the vapour pressure over the water surface is more than the atmospheric pressure. This means boiling point of the water will be higher in the pressure cooker than in the open. This will let the cereals and food to be cooked in higher temperature than at 1000C,. Thus, cooking process gets faster. If the molecules were not allowed to collide among themselves, would you expect more evaporation or less evaporation? If the molecules are not allowed to collide with each other, they will have long mean free paths and hence, evaporation will be faster. In vacuum, the external pressure will be very low. So, the liquid will boil and evaporate at very low temperature. Is it possible to boil water at room temperature, say 30°C? If we touch a flask containing water boiling at this temperature, will it be hot? Yes, it is possible to boil water at 300C by reducing the external pressure. A liquid boils when its vapour pressure equals external pressure. By lowering the external pressure, it is possible to boil the liquid at low temperatures. No, the flask containing water boiling at 300C will not be hot. When you come out of a river after a dip, you feel cold. Explain. After a dip in the river, the water that sticks to our body gets evaporated. We know that evaporation takes place faster for higher temperatures. Thus, the molecules that have the highest kinetic energy leave faster and that is how heat is given away from our body. As a result of it, temperature of our body falls down due to loss of heat and we feel cold. Temperature is defined as the average kinetic energy of the molecules in a gas sample. Average is same for all the molecules of the sample. So, kinetic energy is the same for all. Hence, correct answer is (d). (d) high pressure and high temperature. At low pressure, the concentration of gas molecules is very low. Hence, the kinetic assumption that the size of the molecules can be neglected compared to the volume of the container applies. At high temperature, molecules move very fast. So, they tend to collide elastically and â€‹forces of interaction between the molecules minimise. This is the required idea condition. Thus, (b) is the correct answer. According to the kinetic theory, molecules show straight line in motion (translational). So, the kinetic energy is essentially transitional. Thus, (a) is the correct answer. Temperature of a gas is directly proportional to its kinetic energy. Thus, energy of an ideal gas depends only on its temperature. Thus, (d) is the correct answer. Which of the following gases has maximum rms speed at a given temperature? Since hydrogen has the lowest Mo compared to other molecules, it will have the highest rms speed. Figure shows graphs of pressure vs density for an ideal gas at two temperatures T1 and T2. (d) Any of the three is possible. 3Pρ. This means rms velocity of gas with T1 molecules is greater than T2 molecules. Again, gas with higher temperature has higher rms velocity. vrms=3RTM⇒vrms2=3RTM⇒vrms2 α TThus, (c) is the correct answer. Suppose a container is evacuated to leave just one molecule of a gas in it. Let va and vrms represent the average speed and the rms speed of the gas. Speed is constant and same for a single molecule. Thus, rms speed will be equal to its average speed. Thus, (c) is the correct answer. ⇒vOrmsvHrms=3RTMO3RTMH⇒vOrmsvHrms=3RT323RT2⇒vOrmsvHrms=14⇒500vHrms=14⇒vHrms=4×500=2000 ms-1Hence, the correct answer is (b). Let the number of moles in the gas be n.
Given: v=3RT32Let the new rms speed be v’.Molecule dissociate, M=16v’=3R2T16=3R4T32=23RT32=2vThus, (c) is the correct answer. (d) number of molecules in the gas. Here,PV=nRT …1Also,k=RN⇒R=kN …2Now,PV=nkNT From eq. 1 and eq. 2⇒nN=PVkTnN = Number of moleculesPVkT=Number of moleculesThus, (d) is the correct answer. According to the graph, P is directly proportional to T.
⇒P=nRVTGiven: P α TThis means nRV is a constant. So, V is also a constant.Constant V implies the process is isochoric. (d) there will be no vapour. As the liquid is decreasing, the liquid is vapourised. We know that vapourisation cannot occur in saturated air and there cannot be any liquid with no vapour at all. So, the vapour in the remaining part is unsaturated. Since the amount of liquid is constant, there is no vapourisation of the liquid inside the bottle. Also, since there cannot be a liquid with no vapours at all and vapourisation cannot take place in the remaining saturated part, the remaining part must be saturated with the vapours of the liquid. (d) first increases and then becomes constant. As the vapour is injected, the pressure of the chamber increases. But when the pressure becomes equal to the saturated vapour pressure, it condenses. So, if more vapour is injected beyond the saturated vapour pressure, the vapour will condense and thus the vapour pressure will be constant. A vessel A has volume V and a vessel B has volume 2V. Both contain some water which has a constant volume. The pressure in the space above water is pa for vessel A and pb for vessel B. The maximum pressure attainable above the water will be saturated vapour pressure at that temperature. Since saturated vapour pressure does not depend upon volume, both the vessels will have same pressure. Consider a collision between an oxygen molecule and a hydrogen molecule in a mixture of oxygen and hydrogen kept at room temperature. Which of the following are possible? (a) The kinetic energies of both the molecules increase. (b) The kinetic energies of both the molecules decrease. (c) kinetic energy of the oxygen molecule increases and that of the hydrogen molecule decreases. (d) The kinetic energy of the hydrogen molecule increases and that of the oxygen molecule decreases. According to Kinetic theory, postulates collision between molecules are elastic. This means that kinetic energy after any collision is conserved because while one one gains kinetic energy, another loses it. Both options, (c) and (d) consider the conservation of kinetic energy in the collision. Thus, (c) and (d) are correct answers. (d) with smaller average kinetic energy. 8kTπm. We observe that greater the mass, lesser is the average speed of the molecule. Since an oxygen molecule is heavier than a hydrogen molecule, the oxygen molecule will hit the wall with smaller average speed. Which of the following quantities is zero on an average for the molecules of an ideal gas in equilibrium? The molecules move in all possible directions in an ideal gas at equilibrium. Since momentum is a vector quantity for every direction of motion of the molecules, there exists an opposite direction of motion of the other. Hence, the average momentum is zero for an ideal gas at equilibrium. Keeping the number of moles, volume and temperature the same, which of the following are the same for all ideal gases? (d) Average magnitude of momentum. 13mnu2. We know that pressure depends on volume, number of molecules and root mean square velocity. Also, root mean square velocity depends on the temperature of the gas. Since the number of molecules, volume and temperature are constant, pressure of the gas will not change. Average momentum of a gas sample is zero, so it does not depend upon any of these parameters. Which of the following quantities is the same for all ideal gases at the same temperature? Kinetic energy per mole of an ideal gas is directly proportional to T. So, it will be the same for all ideal gases. Number of molecules in 1 mole of an ideal is the same for all ideal gases because ideal gases obey Avogadro’s law. Thus, (a) and (c) are correct answers. (d) nature of the gas. In an ideal gas, the equation of state is given byPV=nRT⇒PV=nNARNAT⇒PV=nNAkT⇒1nNA=kTPVMultiplying both sides by mass of the gas M, we getMnNA=MkTPVNow, nNA gives the total number of molecules of the gas.Also, MnNA gives the mass of a single molecule.Hence,MkTPV is the mass of a single molecule of the gas, Molecular mass is a property of the gas.Thus, (d) is the correct answer. Calculate the volume of 1 mole of an ideal gas at STP. STP means a system having a temperature of 273 K and 1 atm pressure. Find the number of molecules of an ideal gas in a volume of 1.000 cm3 at STP. Find the number of molecules in 1 cm3 of an ideal gas at 0°C and at a pressure of 10−5 mm of mercury. Calculate the mass of 1 cm3 of oxygen kept at STP. Equal masses of air are sealed in two vessels, one of volume V0 and the other of volume 2V0. If the first vessel is maintained at a temperature 300 K and the other at 600 K, find the ratio of the pressures in the two vessels. Let the pressure and temperature for the vessels of volume V0 and 2V0 be Pâ€‹1, T1 and P2 , T2, respectively. Since the two vessels have the same mass of gas, n1 = n2 = n.
An electric bulb of volume 250 cc was sealed during manufacturing at a pressure of 10−3 mm of mercury at 27°C. Compute the number of air molecules contained in the bulb. Avogadro constant = 6 × 1023 mol−1, density of mercury = 13600 kg m−3 and g = 10 m s−2. A gas cylinder has walls that can bear a maximum pressure of 1.0 × 106 Pa. It contains a gas at 8.0 × 105 Pa and 300 K. The cylinder is steadily heated. Neglecting any change in the volume, calculate the temperature at which the cylinder will break. Let T2 be the temperature at which the cylinder will break. 2 g of hydrogen is sealed in a vessel of volume 0.02 m3 and is maintained at 300 K. Calculate the pressure in the vessel. The temperature and pressure at Simla are 15.0°C and 72.0 cm of mercury and at Kalka these are 35.0°C and 76.0 cm of mercury. Find the ratio of air density at Kalka to the air density at Simla. Figure shows a cylindrical tube with adiabatic walls and fitted with a diathermic separator. The separator can be slid in the tube by an external mechanism. An ideal gas is injected into the two sides at equal pressures and equal temperatures. The separator remains in equilibrium at the middle. It is now slid to a position where it divides the tube in the ratio of 1:3. Find the ratio of the pressures in the two parts of the vessel. Let pressure of first and second parts be P1 and P2, respectively. Find the rms speed of hydrogen molecules in a sample of hydrogen gas at 300 K. Find the temperature at which the rms speed is double the speed calculated in the previous part. C=3RTM0⇒C=3×8.3×3000.002⇒C=1932.6 ms-1In the second case, let the required temperature be T.
A sample of 0.177 g of an ideal gas occupies 1000 cm3 at STP. Calculate the rms speed of the gas molecules. The average translational kinetic energy of air molecules is 0.040 eV (1 eV = 1.6 × 10−19 J). Calculate the temperature of the air. Boltzmann constant k = 1.38 × 10−23 J K−1. Consider a sample of oxygen at 300 K. Find the average time taken by a molecule to travel a distance equal to the diameter of the earth. Find the average magnitude of linear momentum of a helium molecule in a sample of helium gas at 0°C. Mass of a helium molecule = 6.64 × 10−27 kg and Boltzmann constant = 1.38 × 10−23 J K−1. The mean speed of the molecules of a hydrogen sample equals the mean speed of the molecules of a helium sample. Calculate the ratio of the temperature of the hydrogen sample to the temperature of the helium sample. Vavg=8RTπMLet temperature for H and He respectively be Tâ€‹1 and T2, respectively. At what temperature the mean speed of the molecules of hydrogen gas equals the escape speed from the earth? Find the ratio of the mean speed of hydrogen molecules to the mean speed of nitrogen molecules in a sample containing a mixture of the two gases. Figure shows a vessel partitioned by a fixed diathermic separator. Different ideal gases are filled in the two parts. The rms speed of the molecules in the left part equals the mean speed of the molecules in the right part. Calculate the ratio of the mass of a molecule in the left part to the mass of a molecule in the right part. Let the temperature of gas in both the chambers be T.
Let the molar mass of gas in the left chamber and right chamber be Mâ€‹1 and M2, respectively. Estimate the number of collisions per second suffered by a molecule in a sample of hydrogen at STP. The mean free path (average distance covered by a molecule between successive collisions) = 1.38 × 10−5 cm. Hydrogen gas is contained in a closed vessel at 1 atm (100 kPa) and 300 K. (a) Calculate the mean speed of the molecules. (b) Suppose the molecules strike the wall with this speed making an average angle of 45° with it. How many molecules strike each square metre of the wall per second? Air is pumped into an automobile tyre’s tube up to a pressure of 200 kPa in the morning when the air temperature is 20°C. During the day the temperature rises to 40°C and the tube expands by 2%. Calculate the pressure of the air in the tube at this temperature. Oxygen is filled in a closed metal jar of volume 1.0 × 10−3 m3 at a pressure of 1.5 × 105 Pa and temperature 400 K. The jar has a small leak in it. The atmospheric pressure is 1.0 × 105 Pa and the atmospheric temperature is 300 K. Find the mass of the gas that leaks out by the time the pressure and the temperature inside the jar equalise with the surrounding. An air bubble of radius 2.0 mm is formed at the bottom of a 3.3 m deep river. Calculate the radius of the bubble as it comes to the surface. Atmospheric pressure = 1.0 × 105 Pa and density of water = 1000 kg m−3. Air is pumped into the tubes of a cycle rickshaw at a pressure of 2 atm. The volume of each tube at this pressure is 0.002 m3. One of the tubes gets punctured and the volume of the tube reduces to 0.0005 m3. How many moles of air have leaked out? Assume that the temperature remains constant at 300 K and that the air behaves as an ideal gas. 0.040 g of He is kept in a closed container initially at 100.0°C. The container is now heated. Neglecting the expansion of the container, calculate the temperature at which the internal energy is increased by 12 J. During an experiment, an ideal gas is found to obey an additional law pV2 = constant. The gas is initially at a temperature T and volume V. Find the temperature when it expands to a volume 2V. A vessel contains 1.60 g of oxygen and 2.80 g of nitrogen. The temperature is maintained at 300 K and the volume of the vessel is 0.166 m3. Find the pressure of the mixture. A vertical cylinder of height 100 cm contains air at a constant temperature. The top is closed by a frictionless light piston. The atmospheric pressure is equal to 75 cm of mercury. Mercury is slowly poured over the piston. Find the maximum height of the mercury column that can be put on the piston. A container of volume 50 cc contains air (mean molecular weight = 28.8 g) and is open to atmosphere where the pressure is 100 kPa. The container is kept in a bath containing melting ice (0°C). (a) Find the mass of the air in the container when thermal equilibrium is reached. (b) The container is now placed in another bath containing boiling water (100°C). Find the mass of air in the container. (c) The container is now closed and placed in the melting-ice bath. Find the pressure of the air when thermal equilibrium is reached. A uniform tube closed at one end, contains a pellet of mercury 10 cm long. When the tube is kept vertically with the closed-end upward, the length of the air column trapped is 20 cm. Find the length of the air column trapped when the tube is inverted so that the closed-end goes down. Atmospheric pressure = 75 cm of mercury. A glass tube, sealed at both ends, is 100 cm long. It lies horizontally with the middle 10 cm containing mercury. The two ends of the tube contain air at 27°C and at a pressure 76 cm of mercury. The air column on one side is maintained at 0°C and the other side is maintained at 127°C. Calculate the length of the air column on the cooler side. Neglect the changes in the volume of mercury and of the glass. An ideal gas is trapped between a mercury column and the closed-end of a narrow vertical tube of uniform base containing the column. The upper end of the tube is open to the atmosphere. The atmospheric pressure equals 76 cm of mercury. The lengths of the mercury column and the trapped air column are 20 cm and 43 cm respectively. What will be the length of the air column when the tube is tilted slowly in a vertical plane through an angle of 60°? Assume the temperature to remain constant. Figure shows a cylindrical tube of length 30 cm which is partitioned by a tight-fitting separator. The separator is very weakly conducting and can freely slide along the tube. Ideal gases are filled in the two parts of the vessel. In the beginning, the temperatures in the parts A and B are 400 K and 100 K respectively. The separator slides to a momentary equilibrium position shown in the figure. Find the final equilibrium position of the separator, reached after a long time. Let the initial pressure of the chambers A and B be PA1 and PB1, respectively. Let the final pressure of chambers A and B be PA2 and PB2, respectively. A vessel of volume V0 contains an ideal gas at pressure p0 and temperature T. Gas is continuously pumped out of this vessel at a constant volume-rate dV/dt = r keeping the temperature constant. The pressure of the gas being taken out equals the pressure inside the vessel. Find (a) the pressure of the gas as a function of time, (b) the time taken before half the original gas is pumped out. p=p01+(V/V0)2where p0 and V0 are constants. Find the temperature of the gas when V = V0. Show that the internal energy of the air (treated as an ideal gas) contained in a room remains constant as the temperature changes between day and night. Assume that the atmospheric pressure around remains constant and the air in the room maintains this pressure by communicating with the surrounding through the windows, doors, etc. 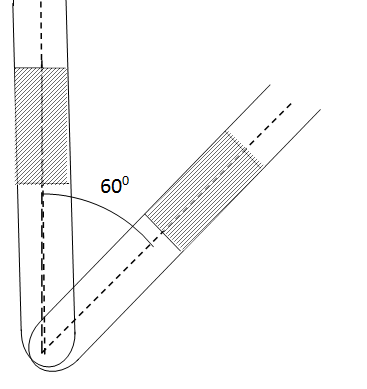 Figure shows a cylindrical tube of cross-sectional area A fitted with two frictionless pistons. The pistons are connected to each other by a metallic wire. Initially, the temperature of the gas is T0 and its pressure is p0 which equals the atmospheric pressure. (a) What is the tension in the wire? 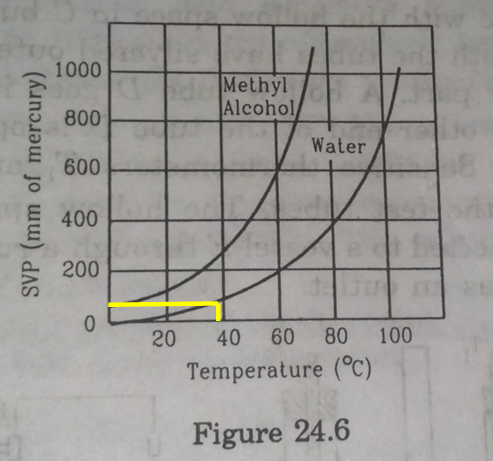 (b) What will be the tension if the temperature is increased to 2T0? Figure shows a large closed cylindrical tank containing water. Initially the air trapped above the water surface has a height h0 and pressure 2p0 where p0 is the atmospheric pressure. There is a hole in the wall of the tank at a depth h1 below the top from which water comes out. A long vertical tube is connected as shown. (a) Find the height h2 of the water in the long tube above the top initially. (b) Find the speed with which water comes out of the hole. (c) Find the height of the water in the long tube above the top when the water stops coming out of the hole. An ideal gas is kept in a long cylindrical vessel fitted with a frictionless piston of cross-sectional area 10 cm2 and weight 1 kg (figure). The vessel itself is kept in a big chamber containing air at atmospheric pressure 100 kPa. The length of the gas column is 20 cm. If the chamber is now completely evacuated by an exhaust pump, what will be the length of the gas column? Assume the temperature to remain constant throughout the process. area 10 cm2 and weight 1 kg. The length of the gas column in the vessel is 20 cm. The atmospheric pressure is 100 kPa. The vessel is now taken into a spaceship revolving round the earth as a satellite. The air pressure in the spaceship is maintained at 100 kPa. Find the length of the gas column in the cylinder. Two glass bulbs of equal volume are connected by a narrow tube and are filled with a gas at 0°C at a pressure of 76 cm of mercury. One of the bulbs is then placed in melting ice and the other is placed in a water bath maintained at 62°C. What is the new value of the pressure inside the bulbs? The volume of the connecting tube is negligible. The weather report reads, “Temperature 20°C : Relative humidity 100%”. What is the dew point? RH=Vapour pressure of airSVP at the same temperature=1⇒Vapour pressure of air=SVP at the same temperatureSo, the air is saturated at 200C​. So, dew point is 200C. The condition of air in a closed room is described as follows. Temperature = 25°C, relative humidity = 60%, pressure = 104 kPa. If all the water vapour is removed from the room without changing the temperature, what will be the new pressure? The saturation vapour pressure at 25°C − 3.2 kPa. The temperature and the dew point in an open room are 20°C and 10°C. If the room temperature drops to 15°C, what will be the new dew point? Here,Temperature = 20°CDew point = 10°CAir becomes saturated at 10°C. But if the room temperature is lowered to 15°C, the dew point will still be at 10°C. Pure water vapour is trapped in a vessel of volume 10 cm3. The relative humidity is 40%. The vapour is compressed slowly and isothermally. Find the volume of the vapour at which it will start condensing. Here,RH=40%V1=10×10−6m3RH=VPSVP=0.4Let SVP = PoCondensation occurs when VP = Po.⇒P1=0.4Po⇒P2=PoSince the process is isothermal, applying Boyle’s law we getP1V1=P2V2⇒V2=P1V1P2⇒V2=0.4Po×10×10−6Po⇒V2=4.0×10−6⇒V2=4.0cm3Thus water vapour condenses at volume 4.0 cm3. A barometer tube is 80 cm long (above the mercury reservoir). It reads 76 cm on a particular day. A small amount of water is introduced in the tube and the reading drops to 75.4 cm. Find the relative humidity in the space above the mercury column if the saturation vapour pressure at the room temperature is 1.0 cm. 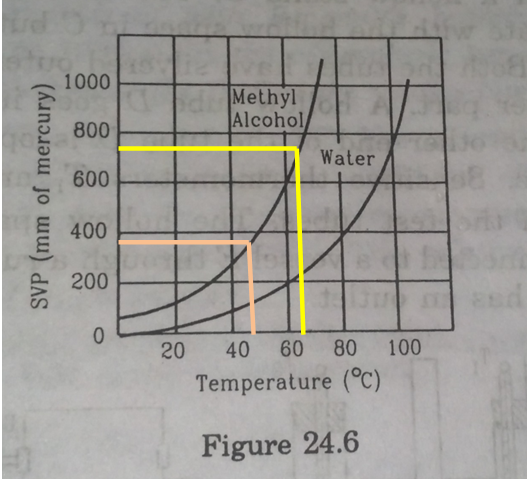 Using figure of the text, find the boiling point of methyl alcohol at 1 atm (760 mm of mercury) and at 0.5 atm. We drop a perpendicular on x-axis corresponding to the saturated vapour pressure 760 mm. This gives the boiling point 650 of methyl alcohol. For 0.5 atm pressure, corresponding pressure in mm Hg will be 375 mm. We drop a perpendicular on x-axis corresponding to the saturated vapour pressure 375 mm. This gives the boiling point 480 of methyl alcohol. The human body has an average temperature of 98°F. Assume that the vapour pressure of the blood in the veins behaves like that of pure water. Find the minimum atmospheric pressure which is necessary to prevent the blood from boiling. Use figure of the text for the vapour pressures. When we convert the temperature to 0C, we get59(F−32)=59(98−32)=36.70CWe drop perpendicular corresponding to a temperature of 36.70C on Y-axis from the curve of pure water. This gives the boiling point of blood 50 mm of Hg. A glass contains some water at room temperature 20°C. Refrigerated water is added to it slowly. when the temperature of the glass reaches 10°C, small droplets condense on the outer surface. Calculate the relative humidity in the room. The boiling point of water at a pressure of 17.5 mm of mercury is 20°C and at 8.9 mm of mercury it is 10°C. 50 m3 of saturated vapour is cooled down from 30°C to 20°C. Find the mass of the water condensed. The absolute humidity of saturated water vapour is 30 g m−3 at 30°C and 16 g m−3 at 20°C. A barometer correctly reads the atmospheric pressure as 76 cm of mercury. Water droplets are slowly introduced into the barometer tube by a dropper. The height of the mercury column first decreases and then becomes constant. If the saturation vapour pressure at the atmospheric temperature is 0.80 cm of mercury, find the height of the mercury column when it reaches its minimum value. 50 cc of oxygen is collected in an inverted gas jar over water. The atmospheric pressure is 99.4 kPa and the room temperature is 27°C. The water level in the jar is same as the level outside. The saturation vapour pressure at 27°C is 3.4 kPa. Calculate the number of moles of oxygen collected in the jar. A faulty barometer contains certain amount of air and saturated water vapour. It reads 74.0 cm when the atmospheric pressure is 76.0 cm of mercury and reads 72.10 cm when the atmospheric pressure is 74.0 cm of mercury. Saturation vapour pressure at the air temperature = 1.0 cm of mercury. Find the length of the barometer tube above the mercury level in the reservoir. On a winter day, the outside temperature is 0°C and relative humidity 40%. The air from outside comes into a room and is heated to 20°C. What is the relative humidity in the room? The saturation vapour pressure at 0°C is 4.6 mm of mercury and at 20°C it is 18 mm of mercury. The temperature and humidity of air are 27°C and 50% on a particular day. Calculate the amount of vapour that should be added to 1 cubic metre of air to saturate it. The saturation vapour pressure at 27°C = 3600 Pa. The temperature and relative humidity in a room are 300 K and 20% respectively. The volume of the room is 50 m3. The saturation vapour pressure at 300 K 3.3 kPa. Calculate the mass of the water vapour present in the room. The temperature and the relative humidity are 300 K and 20% in a room of volume 50 m3. The floor is washed with water, 500 g of water sticking on the floor. Assuming no communication with the surrounding, find the relative humidity when the floor dries. The changes in temperature and pressure may be neglected. Saturation vapour pressure at 300 K = 3.3 kPa. A bucket full of water is placed in a room at 15°C with initial relative humidity 40%. The volume of the room is 50 m3. (a) How much water will evaporate? (b) If the room temperature is increased by 5°C, how much more water will evaporate? The saturation vapour pressure of water at 15°C and 20°C are 1.6 kPa and 2.4 kPa respectively. Evaporation occurs as long as the atmosphere is not saturated.